Yazgac is available for free but your generous donations will support Yazgac and its further development. 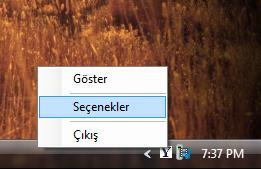 Yazgac is a free desktop application, that allows you to type special Turkish characters (ç,ı,ş,ğ,ü,ö) or correct your text by automatically placing them. These characters are not part of non-Turkish keyboards (and ASCII table), thus, are usually omitted in daily life by many. Yazgac is intended to help users type and/or correct Turkish text with standard US keyboards and without changing their keyboard settings. Please see features below. Also, you can watch a full presentation that explains the three main features of Yazgac in demo setion. You can download and install Yazgac for non-commercial use. Hopefully, it will be useful to you. Please send us your comments and questions. Please see demo section for a full presentation of Yazgac that you can navigate at your own pace. Note: You can customize the key combination in options dialog of Yazgac. 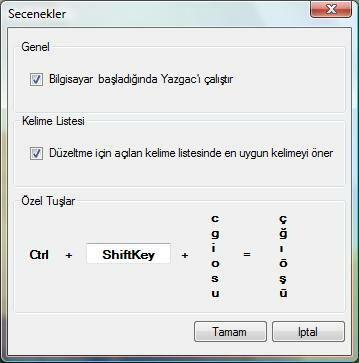 Copy+paste any (long) text that you wish to correct; double-click on any word to have a drop-down menu that displays possible versions with special Turkish characters, just select the correct one. Yazgac suggests the correct version and learns from your selections! Copy+paste any (long) text that you wish to correct; and correct all instantly with click of a button. This feature is still in beta, the algorithm and database are improving. With the latest release, you can use Yazgac to type on any text editor, or application. The application just needs to support Unicode or Turkish font. The key combination can be modified at the options dialog. Please send us your comments and suggestions using the form below.